Running back St. John Lessary is Kahuku's only returning starter on offense this season. After missing the state tourney and finishing at No. 10 in last year's Star-Bulletin Football Top 10, the Kahuku Red Raiders were ready for a change. Still, returning players were stunned when coach Reggie Torres and his staff brought in a new offense and new defense for spring ball. The new schemes fit Kahuku's personnel - heavy and talented at running back, linebacker and defensive back. Kahuku, state champion in five of the last eight years, hasn't tossed its traditional I formation into the ocean. By adding a one-back (ace) formation, the Red Raiders are looking for the right fit. They may air the ball out more, but look for running backs St. John Lessary III and Alapeti Magalei to be among the beneficiaries. Kahuku opens the season at No. 4 in the Star-Bulletin Football Preseason Top 10. 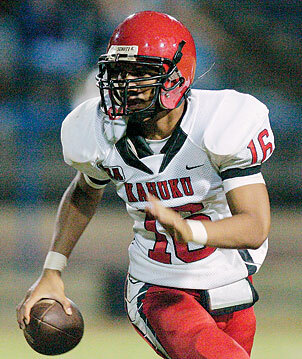 Jray Galeai started at quarterback for Kahuku last night. This season he will play safety and wideout and return kicks. They wear red and white, hail from the North Shore and have a proud following capable of filling any high school stadium on the island. The Kahuku Red Raiders are, however, just a bit different this season. The defense has switched to a 3-4 and the offense has a new one-back attack. Yes, coach Reggie Torres is proving that an old dog can learn new tricks. Kahuku is hungry for a return to the state tournament, which they missed last season after a playoff loss to Kapolei. "We're still a running program, but we're looking at opening it up," said Torres, who consulted with gurus Ron Lee (UH) and Robert Anae (BYU) in the offseason. Despite relative inexperience, Kahuku drew a No. 4 ranking from coaches and media in the Star-Bulletin Football Preseason Top 10. On paper: Kahuku has won five of the last eight Division I state titles, but has a fairly young team this season. With 80 players, including about 40 returnees, and only three returning starters, there are opportunities galore for playing time. Twelve sophomores dot the roster, many of whom are in the trenches. Their youth showed in scrimmages with Word of Life and Mililani, but talent also shined. 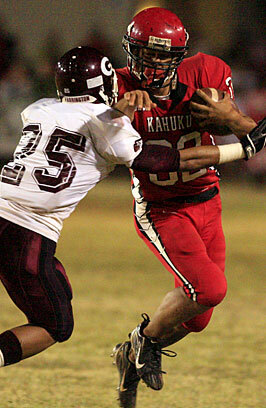 Kahuku ran the ball with authority, using a very unfamiliar "stretch" play to give its posse of runners room to roam. The one-back, or ace, sets also allow for three receivers, which should help new quarterback A.J. Kubota (5-foot-11, 160). "He's shown the most potential," Torres said of Kubota, who won a close battle with Sage Kaka and Siatima Tapusoa for the starting job. The new offense will give running backs like St. John Lessary III (6-0, 170) and Alapeti Magalei (5-9, 203) more cutbacks. "John is a more fluid runner and can cut on a dime. Peti is strong, keeps moving his legs. He's hard to bring down," Torres said. Former quarterback Jray Galeai is now Mr. Utility - safety, wideout and returner - allowing his speed and explosiveness to be maximized. Aulola Tonga (6-3, 205) and Galeai (6-0, 177) give Kahuku an elite secondary. The move to a 3-4 defense gives Kahuku more angles to blitz from and suits its personnel. Sophomore Ben Mamea (5-11, 185) and seniors Irwin Ah-Hoy (6-0, 200) and Kamalani Alo (6-1, 192) anchor the 'backers. The skinny: Don't be surprised if Kahuku uses both ace and I sets over the course of the year. With the I, Kahuku can always overpower defenses, but the ace could propel the offense to a new level - and provide some unpredictability. X factor: The learning curve is in effect for both O- and D-lines. Jonathan Lautaha (6-1, 255) is the lone senior starter on the O-line. They've had to learn a new offense, but Torres is pleased so far. That's a plus, considering the offseason knee injury that derailed fullback Dustin Akiyama, triggering Kahuku's evolution into a new offense.